The LustKillers newest record, That Which Does Not Kill Us is aptly titled due to the challenging circumstances that caused release delays and the ultimate departure of lead guitarist Bryan Wilkinson. “The record was recorded at the end of a tour my brother did with us on bass. We’d worked up a batch of tunes on the road and went for it in four days. There were endless, nightmarish reasons for the delay I care not to relive,” said singer and guitarist Adam Becvare. The loss of Wilkinson has forced Becvare to takeover all guitar duties, forcing The LustKillers to command the stage as a three piece. “My bassist Corsh and I have been knocking it out as a three piece. Finally working that out has made things more available. LustKillers did a lot of 3 piece playing leading up to Black Sugar Sessions (previous album) but That Which Does Not Kill Us was arranged with two guitars in mind. It took a bit to sort out but really lets the ears breathe live. I just don’t get to connect as much with the crowd as I’m putting so much into the playing,” said Becvare. That Which Does Not Kill Us sounds urgent and tough but ballads such as Throw Away highlight Becvare’s ability to craft a memorable melody. He reflected on his newest offering. That Which Does Not Kill Us stands as a testament to Becvare’s resolve. Having triumphed over the well-publicized split of his previous outfit, The Black Halos, The LustKillers have released a memorable record highlighting all the reasons why they’re able to expand on their success and refine their songwriting without pandering to audiences. 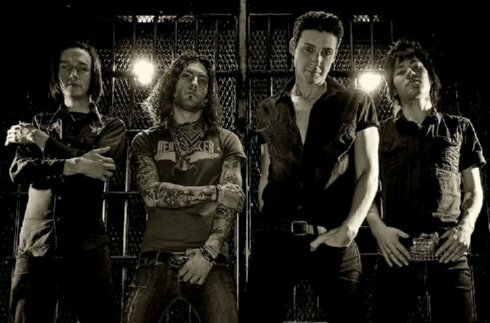 In addition to fronting The LustKillers Becvare joined surviving members from Lords Of The New Church for a much-anticipated reunion back in 2003. The UK shows were not always sold out events but one can’t argue playing opposite of Brian James to be anything less than an honor. Becvare once stated there may be a second reunion in the works, but progress has been slow. He added he has an album’s worth of material set aside for James. That Which Does Not Kill Us won’t be released on vinyl proper, but digitally. Becvare expanded on the group’s decision to release the record online. The LustKillers have benefited greatly from their strong Internet presence but Becvare expressed drawbacks to society’s blind embracing of technology and how creativity can ultimately suffer. For Becvare and The LustKillers, the stage is the only place they want to be. Extensive U.S. tours has Becvare ready to forge new journeys and share his music with those unable to attend shows. If anything can be learned from the challenges The LustKillers faced, the best way to triumph over negativity is to put the positive in motion and That Which Does Not Kill Us may serve as the group’s mantra. “As for transcending the negative, finally getting my Triumph 955 Triple has been my salvation. Unlike many, I have a lot to sacrifice and I’ve done so again and again to play. Many got nothing to lose. Doing it and seeing things thru is the best revenge,” concluded Becvare.